While working in one my Esri-Leaflet based application, I am stumbled on rendering dynamic map layers on tiled basis. Esri leaflet-api does the perfect job on non-tiled layer display but L.esri.DynamicMapLayer, doesn’t provide the tiled dynamic map layers. Looking around I came across the Tiled dynamic layer plugin for esri-leaflet, for displaying the DynamicMapLayer in tiled mode. 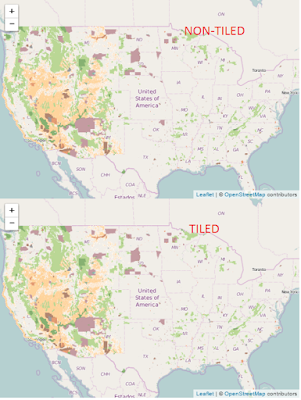 Here I have created both non-tiled and tiled DynamicMapLayer version for comparison using plain esri-leaflet and esri-leaflet with plugin.